Recognizing that one out of every four individuals who are homeless is a child under the age of 18, the Hawaii Community Foundation spearheaded an innovative, three-year program called HousingASAP. HousingASAP emerges from a landscape characterized by pressing community needs and changes in policy priorities which focus on housing homeless families and individuals, and trends in funding from government and private sources. There are an estimated 805 homeless families (households with children) on any given day, based on the 2016 State of Hawaii Point-in-Time Count of those who are homeless. A high percentage (77%) of homeless families are in shelters, which is one of the reasons HCF chose to focus its support on shelter providers working with families. Of the 14,282 people who accessed homeless services in Hawaii in 2014, half of them belonged to families with minor children. Increase by 20% the number of families housed in permanent housing. Decrease by 20% the number of days it takes to stably house families. Decrease by 20% the number of families who return to homelessness. Collaborate, coordinate, share information, and take action. Improve organizational performance, adaptability, and leadership. Enhance their ability to use data to make decisions and show achievement. Better equip organizations with skills to address policy and funding changes. The eight organizations selected to participate provide a critical mass of services, providing more than 50% of the shelter beds available for families in Hawaii and serving three of the state’s four counties. Representatives of HousingASAP’s participating organizations are some of the most visible and influential leaders addressing homelessness and vulnerable populations in the state. HousingASAP is part of HCF’s Pathways to Resilient Communities Initiative. This initiative builds on the successful model of a previous funders collaborative, Hawaii Community Stabilization Initiative, which leveraged $4 million from 12 funders to help families and individuals access more than $23 million in services and benefits during the Great Recession in 2008. Pathways to Resilient Communities is a $12 million initiative supported by 15 funders focused on helping vulnerable populations in three areas – helping kupuna in need, families facing homelessness and high-need middle school students. Interested in learning more about our HousingASAP programs ? While there has been an increase in the number of homeless families placed in permanent housing and a decrease in the number of people returning to shelters after placement, the measure that has not improved is the number of days between intake and exit to permanent housing, which, in fact, has increased. In terms of the network, the year culminated in member organizations developing capacity building grant proposals based on their organizational self-assessments. The purpose of the grants is to increase each organization’s effectiveness in achieving the goals of HousingASAP. Changing landscape: While the federal government and evidence-based best practices align with Housing First and HousingASAP, some of our local and state efforts do not. Permanent Housing: We need to keep the focus on moving families into permanent housing. The recent push to expand shelters and criminalize homelessness in Hawai‘i runs counter to the direction of the U.S. Interagency Council on Homelessness and the fact that there are approximately 550 empty shelter beds on any given night on O‘ahu alone, according to the 2015 Point-in-Time Count. Long-term: We need more affordable housing statewide. While we can assist our providers with moving toward a Housing First philosophy, in the long run, we simply need more affordable housing supply. The premise behind the design of HousingASAP remains the same as it proceeds: When service providers can make and adapt to changes required by changing policies and best practices, and increase collaboration among providers and with other stakeholders, services for families will be improved and effectiveness of advocacy at the policy level will be increased. 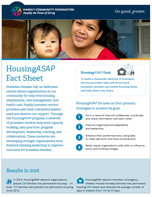 The first year of HousingASAP (July 2014 – June 2015) focused on leadership development, organizational capacity building, data use and evaluative inquiry, and best practices in family homelessness through a collaborative learning community. The network kicked off with a two-day meeting in September 2014, followed by in-person meetings every other month and ongoing development work with participating organizations and leaders — including organizational assessments, data use assessments, coaching, and leadership development. Housing First principles adopted by the HousingASAP network include creating low barriers to entry and a plan focused on permanent housing. Because changing the system of homelessness services requires participation from a broad group of community stakeholders, HousingASAP has engaged federal, state and local homeless service stakeholders to work together. HCF expects these cross-sector discussions to lead to systems improvements, policy changes, and advancement and scaling of promising practices. The network has housed 20% more families than the prior year. Recidivism has decreased by more than 20%. By tracking quarterly data, the network is already improving performance. The network has identified multiple opportunities for working together going forward. Kahumana Community was founded in 1974. Their mission is to co‐create a healthy, inclusive, and productive community with homeless families, people with disabilities, and youth. It achieves thismission by integrating mutually supportive social services, social ventures, and training venues at three sites in Waianae, on the island of Oahu. Kahumana Community provides two types of social services: transitional housing for homeless families and programs, and Hale Lana O Kahumana, for people with intellectual and developmental disabilities. Founded by the Maryknoll Sisters from New York, Catholic Charities Hawaii (CCH) has carried out the social mission of the Church in Hawaiʻi since 1947. Their mission is to help people, especially those with the greatest need, regardless of their faith or culture. In 2003, CCH became the first organization in the State to have a nationally accredited transitional housing program. CCH has operated the Maili Land Transitional Housing Program since 1990 and seeks to create more affordable housing opportunities. Family Life Center (FLC) is a faith‐based organization that was incorporated in 1982, with a mission to stabilize the lives of individuals in their time of need with shelter, food, clothing, and access to life changing support services. 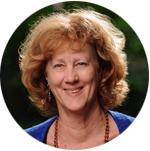 Their target population is the homeless or those at‐risk of homelessness who live in the County of Maui. Programs include: Food and clothing distribution; Outreach services; Emergency Shelter; Housing placement and rental assistance; Affordable rentals; and other support services. Their most significant achievement is the recent purchase of two apartment complexes which serve as affordable rentals, both debt free. Since Family Promise of Hawai‘i (FPH) opened its doors in 2006, they have helped over 1,400 parents and children transition out of homelessness. Their mission is to mobilize existing community resources to aid families with children experiencing homelessness and help them transition to sustainable independence. FPH operates two shelters, Honolulu and Kailua, providing laundry facilities, mail, showers, telephone, computer & internet access, daily meals, life skills training, employment assistance and weekly case management. Their partnerships and numerous community volunteers enable them to successfully house families. In 2010, the Roman Catholic Diocese of Honolulu officially announced that the Office for Social Ministry's Care‐A‐Van department became HOPE Services Hawaii, Inc. (HOPE). HOPE's mission is to "bring to life gospel values of justice, love, compassion and hope through service, empowerment and advocacy." Since the incorporation of HOPE, new programs and services were expanded to meet the growing safety net needs of persons experiencing homelessness on Hawaii Island including the West Hawaii Emergency Housing Program, a transitional housing and affordable rental housing program for low income families. IHS, The Institute for Human Services, is Hawaii’s oldest and largest multi‐service center working to end and prevent homelessness on O‘ahu. As an emergency shelter, IHS stabilizes homeless individuals and families by comprehensively assessing and triaging their core reasons for becoming homeless in order to deliver an array of services that qualifies them to obtain and maintain a home and live a sustainable lifestyle. Wrap around services include emergency shelter, meals, healthcare, case management, employment, children enrichment, housing and homeless outreach. Mission Statement: The successful transition of military veterans and their families through the provision of housing, counseling, career development and comprehensive support. As an agency, U.S.VETS has been providing services to veterans and their families across the nation for nearly 21 years. In Hawaii, U.S.VETS has proudly served veteran and non‐veteran households for eleven years. Specific to the Waianae area, U.S.VETS has provided comprehensive services at the Waianae Civic Center’s Paiolu Kaiaulu since 2007 (Emergency & Transitional Housing), and Kulia I Ka Nu‘u program since September 2013 (Transitional & Affordable Permanent Housing Opportunities). Waikiki Health was established in 1967, and was recognized as a Federally Qualified Health Center in 1992. The mission of Waikīkī Health is to provide quality medical and social services that are affordable and accessible for everyone, regardless of ability to pay. Waikīkī Health operates seven service sites, including: Next Step Shelter; Youth Outreach, assisting homeless youth; Care‐A‐Van Drop‐in Clinic, providing medical and support services to homeless and housed populations; and Care‐A‐Van Mobile Medical Clinic.